Kansas City, Missouri—The mission of the Arts Council of Metropolitan Kansas City is to advance and support the arts by increasing funding and awareness of art and cultural initiatives in the community, and to establish the arts as integral to economic development. Managed by the organization, the ArtsKC Fund redistributes grants to other art organizations and individual artists, helping to bring art into the lives of 500,000 people a year. The Arts Council's annual budget is approximately $1.5 million. Half of that budget is covered by anchor grants, but the Arts Council is responsible for raising the other half on their own. For Kelly Ellison, director of development, that was a challenge. "For every development director, the proverbial chasing of the tail is something you just don't want to do," she says. "There's a point at which you get done raising your annual budget, and then you have to do it all over again. It's exhausting." When she heard about Benevon, things clicked into place for Ellison. "We intuitively know that individuals are really the ones who can sustain a non-profit, but it's learning how to reach out to those individuals that's really the key. I was looking for a system to follow that was kind of a no-brainer. So that I could just say, "This is the system that I follow, and if I follow this system, I know I will succeed.' And that was very appealing to me." After attending a Benevon introductory session, Ellison generated interest in the Benevon Model within her agency. At the same time, one of her colleagues was contacted by a large foundation to consider submitting a capacity-building grant for the arts. Immediately upon completing the introductory session, they wrote a capacity-building grant to host Benevon for arts agencies in their local area. Within weeks, the grant was approved and they were not only implementing the model, but facilitating training sessions for other arts organizations. Ellison still faced resistance from the board, who was unconvinced the model was a worthwhile venture. "I called every one of them individually, and sat down with each one to watch the Benevon tutorial video with them," Ellison says. "Finally, one person said yes, and then it was like a domino effect." But the biggest hurdle was still to come for the Arts Council. As they attempted to define the mission of their organization, tension arose among the team. "By virtue of saying 'yes' to Benevon, you say 'yes' to deep philosophical changes in how you talk about your agency," Ellison explains. "When you do that it can open up a lot of issues and you really have to be committed to work through that. We had all this conflict among staff about what we thought the Arts Council does, what is most important, and what we were raising the money for, whether it was for the ArtsKC Fund or for operations." Ellison says that Benevon's coaching helped them work through those issues, as did constructing a Point of Entry. The Arts Council feared it wouldn't be able to elicit emotional reactions from donors. After all, the organization didn't have the kinds of heart-wrenching stories of social sector non-profits. Coaching helped the team shift their focus from trying to make their donors cry, to inspiring their donors. Called "ArtsKC360°," their Point of Entry tour inspires guests by explaining the impact of the Arts Council. Artists who have received grants from the organization are present on the tours, sharing the stories of how the funds they received impacted their lives and careers. The team members also share other stories about their programs, and the impact the arts have had on people's lives. One such story is about a man who was working as a security guard at a large hospital. He entered his drawing of Martin Luther King, Jr. in the Arts Council's "Art at Work" program. His piece won within the hospital, and then graduated to the "Art at Work" exhibition, where it won the People's Choice Award. He is now making art on a regular basis, selling it, and using it as patient therapy. "We've really been challenged as to how we explain that arts and culture is an economic driver and how we, at the Arts Council, make that happen," says Ellison. "The Points of Entry are a vehicle for helping us do that." Ellison says that most everyone at the Arts Council of Metropolitan Kansas City now understands the purpose of the Benevon Model. She credits Benevon most of all with clarifying the mission of the Arts Council. 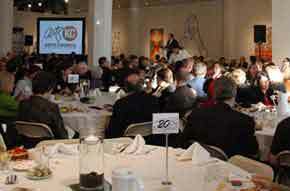 The Art Council's last Ask Event raised $170,000. Meanwhile, other participating arts organizations were implementing the model at the same time. To date, five have held Ask Events of their own. Those events have raised a collective $762,000, 479 new donors, and 1,000 Ask Event attendees. Ellison's team initially feared that competition for donors might arise amongst the various arts organizations participating in the model simultaneously. The results have put those fears to rest. Says Ellison, "It just goes to show that there are passionate people out there, and that there is enough to go around."